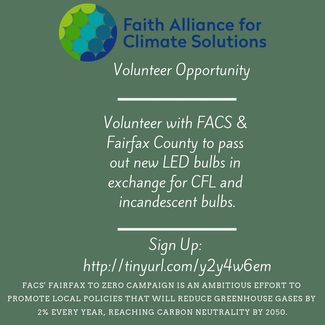 Volunteer with FACS & Fairfax County to pass out new LED bulbs in exchange for incandescent bulbs and CFL bulbs. Below are the date, time and location of the events. We need 1-2 volunteers per location! Volunteers will help Fairfax County handout light bulbs and you will be there as a representative of FACS. FACS' Fairfax to Zero Campaign is an ambitious effort to promote local policies that will reduce greenhouse gases by 2% every year, reaching carbon neutrality by 2050. Working together with Fairfax County we are able to educate and reach people across Fairfax County through the light bulb exchange program. To save money and protect the planet, Fairfax County is giving away up to five, free LED lightbulbs at six Fairfax County libraries in April and May. While LED bulbs are still slightly more expensive, they are cheaper to operate and last longer than incandescent bulbs and even energy efficient CFLs. You could save $5 a year for every old incandescent bulb that you replace with an LED, based on the county’s estimates. The LEDs we’ll be handing out use 85 percent less energy than an old incandescent bulb and 33 percent less energy than a CFL. An LED bulb costs an estimated $1 a year to use compared to $6.10 for an old incandescent. LEDs even save money compared to energy efficient CFLs that cost $1.40 per year. An LED will last 15,000 to 25,000 hours, while a CFL’s lifespan is about 10,000 hours. Incandescent bulbs burn out after only 1,000 hours. Questions about FACS' role in volunteering, contact Jackie Verrecchia at [email protected] and for questions about additional logistics for the day of the event, contact Jessica Lavender at jessica.lavender@fairfaxcounty.gov.